Label Protection tape, Lamination Tapes, Prescription Label Tape,Pharmacy Tape, crystal clear tape, Riverside Paper Co.
Riverside has label protection tapes in several sizes. 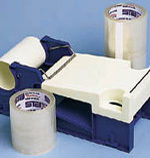 Our pharmacy prescription label protection tape is crystal clear and chemical resistant. Click on the sub-categories below to see the sizes available.